The Runaway Project by PizzaExpress - Lower Parel, Mumbai. There was this one episode in a satirical TV show where central characters manage to get into a fancy uptown restaurant only to be disappointed by the overly expensive minuscule portions of tasteless food. Runaway project which tries to bankroll on the "goodwill" of its parent concern PizzaExpress is a real world example of that satire. 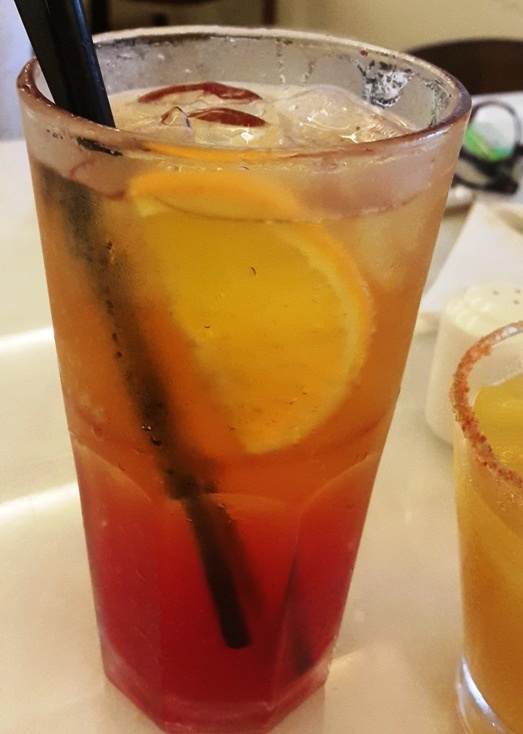 Located in the noisy second floor of the new Skyzone wing in the Phoenix mall complex, this restaurant has a classy lounge like ambiance where any notion of classiness fades away due to the deafening loud music that they play. Apparently, there is a competition going on between Runaway, Soda Bottle openerwala and Chili's where each tries to outdo the other by raising their volumes. The scene is worse than a foul mouthed politician's rally. My small group decided to order two pizzas and an appetizer. Let me tell you that the pricing here is unforgiving. It is more expensive than the likes of Indigo and the food is neither good in quality nor quantity. I sometimes wonder if they are just extracting the prime location's expensive rent from the customers. 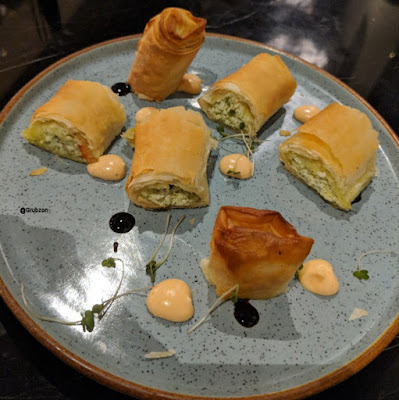 Cigar Club - Described rather fancily in the menu as Filo cigars of cottage cheese and marinated roasted peppers, spiced mayonnaise and balsamic glaze. I wonder if they got a PR professional or a Food Blogger to write this fancy piece of falsehood. 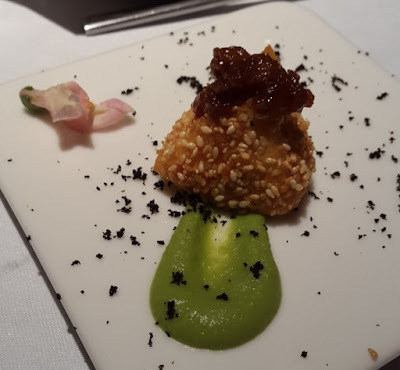 The Spiced mayonnaise and Balsamic glaze were nothing but a few droplets sprinkled randomly in the ugly presentation above. Cottage Cheese translates to paneer here so its rather a cheap Paneer pastry snack that you can buy in most local street bakeries in Mumbai. The taste was dry and it required a dip like accompaniment which seemed to be missing. And I'd rather not call these six small pieces of puff pastry as cigars. 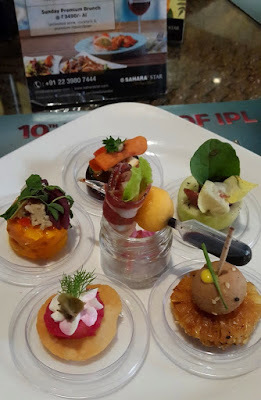 Not to mention if your are paying INR 475 plus taxes for this - you expect a satisfactory portion size and a little bit of effort into making it look appetizing. Hawaiian Pizza - The Pineapple on pizza trope might trigger some pizza enthusiasts but fear not, they replaced actual pineapple with Pineapple paste(chutney). 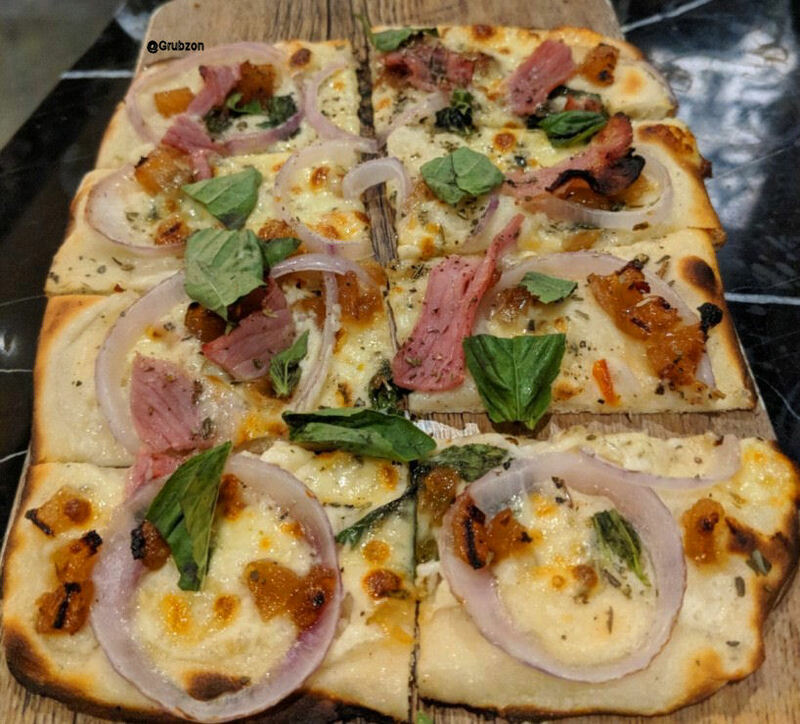 This pizza which is priced at an unforgiving INR 625 plus taxes, was smaller than the smallest of pizzas offered by most pizza exclusive places. It was rather unsatisfying to say the least. 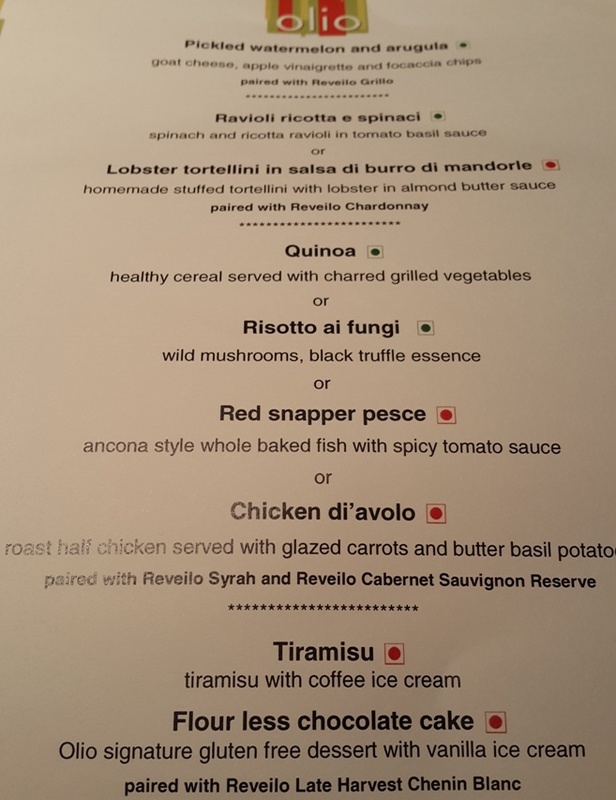 The menu strangely doesn't even mention the carpet bombing of Basil. The basil leaves completely ruin the flavor profile of this pizza. It seemed like a last minute addition by an inexperienced but over enthusiastic chef. Giardiniera Pizza - Recommended by the server for the vegetarians in the group, this was a visually displeasing and overdone pizza (Burns on the crust). Needless to say that it was too less even for one person - let alone be split by two people. The only thing big about this pizza was its name, one wonders if it was actually suggested by Dr. Shashi Tharoor. This was definitely not worth the INR 625 we spent on it. As the grub was far from satisfying or filling - we ended up going to Chili's next door to fill ourselves up. While there are similar expensive places around the city - the portion sizes there at least fill one up. Indigo has gone down in quality over the years but its pizzas at least feel satisfying, the same can be said for the pizzas at a place like Pizza by the bay. The Runaway Project only appears to work on fancy nomenclature and paid promotions via "prominent"(but misleading) social media personalities. The ambiance is killed by the overly loud music, the pricing is bad and the food fails on all fronts. Would I recommend Runaway Project to anyone? No. I'd have to say at this point - if you want a drink - go to any bar themed restaurant in Phoenix. 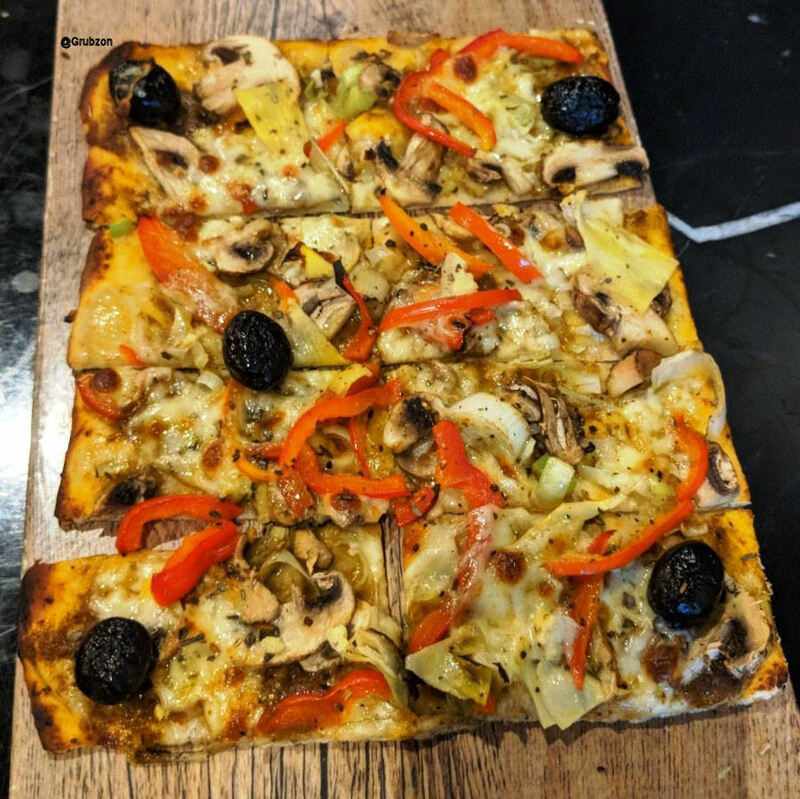 If you want a pizza go to Indigo or Francesco. If you want good mains - Go to Smokehouse or Delhi Heights. Food festivals and special themed menus need no introductions. Every week, there are many food events all over Mumbai. However, your time and resources are still limited and precious so it literally pays to know which festivals and places to attend and which to skip. I usually share my recommendations about festivals on my Instagram these days since it connects faster to an audience who may not have time to read a post like this. 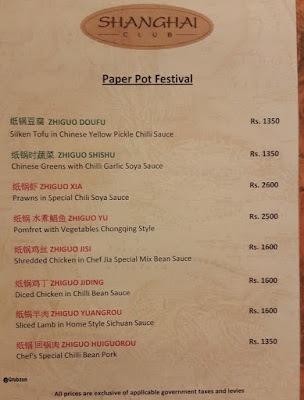 However, I want to chronicle my experience regarding the Paper Pot festival menu at the ITC Grand Central over here. I want this memory to remain in the universe. Shanghai Club is known for its authentic Chinese food and its dishes are designed by ITC's very own Chef Jia who hails from China. 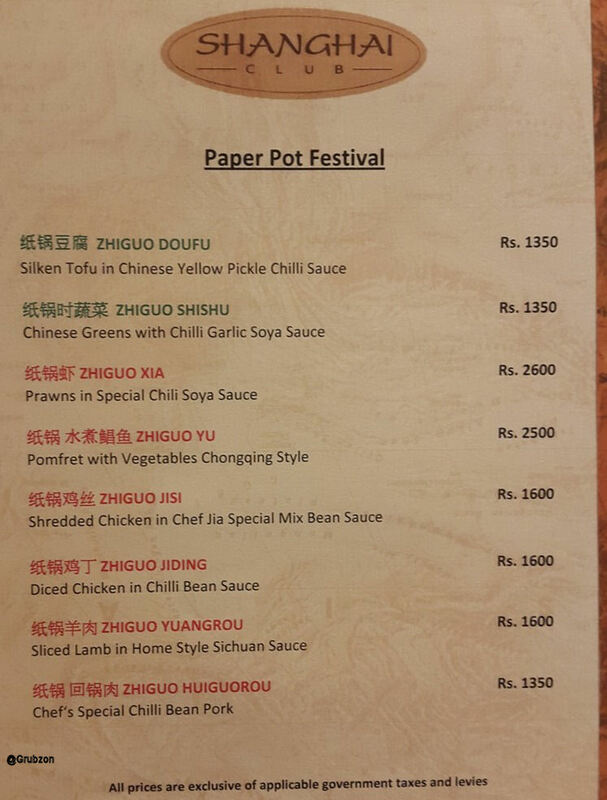 The paper pot festival was his idea and he had to import the paper pots and ingredients straight from China . Food served in Paper pots is a rare occurrence anywhere in the world, let alone in India. Food is usually cooked and served in Paper pots called as Washi - The paper is both fire proof and water proof. You could boil food inside it over high heat and the paper won't catch fire. Although, the restaurant did not cook the food in paper pots in this case, the food was served in paper pots with a flame underneath it to keep it warm. This was a first time in my life, hence it had to be written. I sampled two meaty pots along with one vegetarian pot. It was not just the pots but even the dishes that were unique to the festival. One may not find these dishes outside the festival. 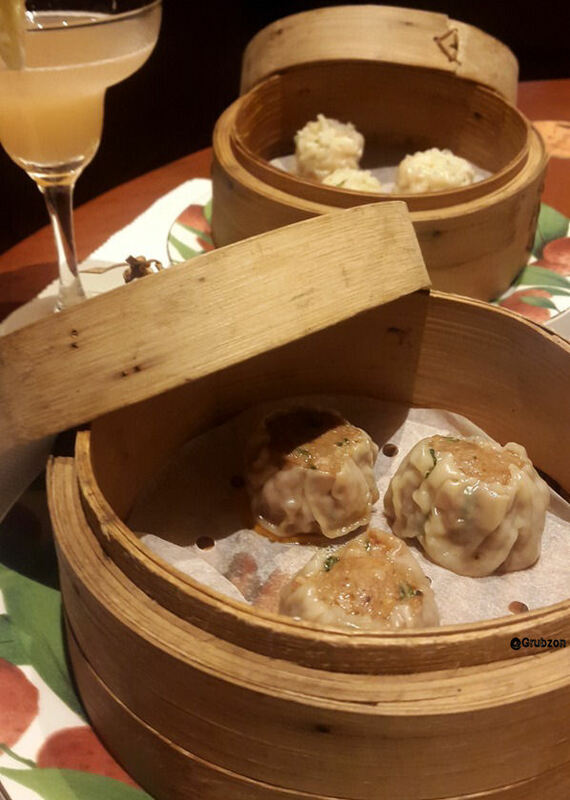 Shanghai club offers an ambiance that seems like a perfect mix of class and luxury. Its good for the sophisticated white collared folks who prefer a noise free rich environment. And its good for the Tourist and food lover types who love a bit of Asian blended into their surroundings. After all, the ambiance does help you in enjoying your food more. 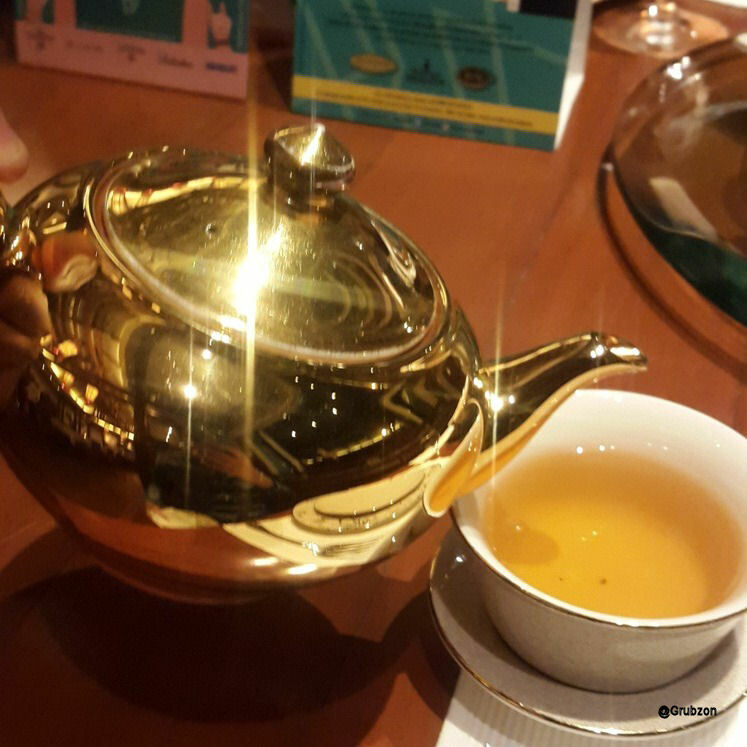 Like a good prologue to a rich novel, White Jasmine tea serves as a good starter to a wonderful Chinese dinner experience. Not really a part of the menu, these dim sums were ordered by my company to add an appetizer course before the pot mains. The Chicken and Prawn based dim sums were of the best quality. Far superior to what one would have had at the many blooming Pan Asian places in the town. 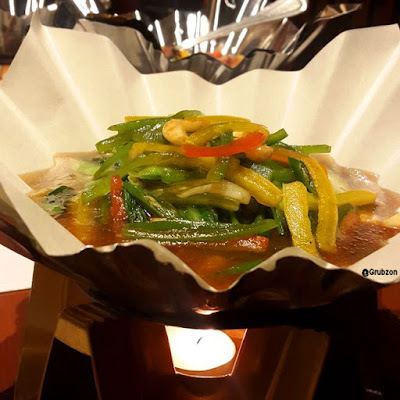 The Chef's special Chilli bean pork was served in a silver colored paper pot. The paper's color was purely aesthetic. 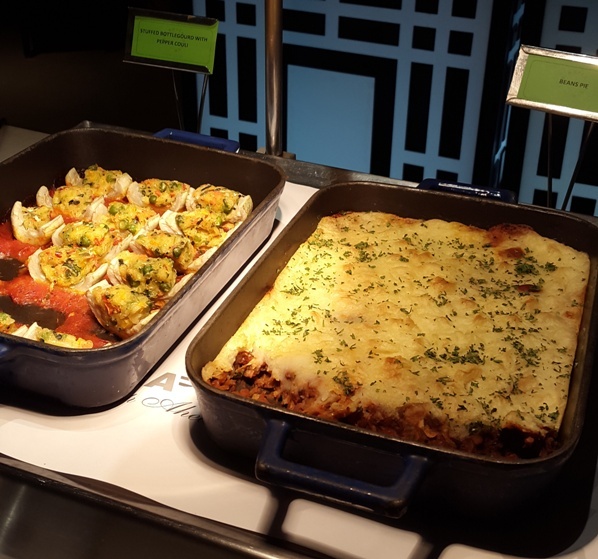 It was the chef's choice to differentiate meat based dishes from the vegetarian ones. The best of the three pot based dishes, the flavor was the king here. Soft flavorful pieces of pork with comforting sauces and veggies tossed in, this dish was quite delightful. It is important to note that Chinese cuisine has a lot of Pork based dishes. 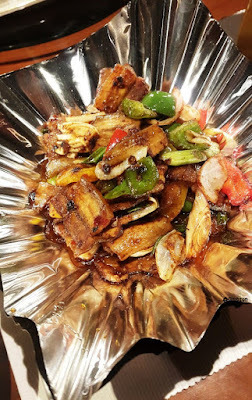 A lot of Asian restaurants discard Pork based dishes from their menus thereby sacrificing cuisine authenticity. Shanghai club thankfully remains truly Chinese. The Prawns in Special Chilli Soya were the seafood lover's delight. The prawns had a rich flavor, texture and the sauces worked well in synergy. Although, I did feel that this dish would have looked better in a white pot. The Chinese greens with Chilli Garlic Soya was a simple but flavorful vegetarian dish. Served in a white paper pot as part of the chef's convention - this dish truly exemplified the paper pot festival. As evident from my picture, the paper is both fire and wetness proof. Plus it does not contain any harmful chemicals or toxins that would affect the food. I ended the meal with these delicious desserts. ITC Grand Central is not as flashy with promoting its events as some other five star properties which call a legion of Instagrammers, journalists and socialites to promote their events. However, the food quality and the experience were no lesser than any other. 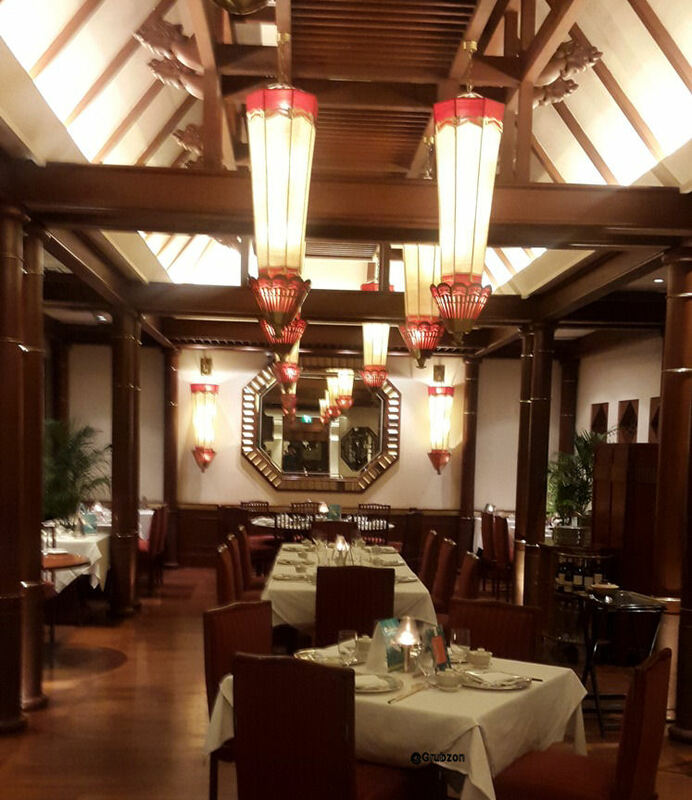 In fact with an experienced Chinese Chef on their team, Shanghai Club ensures that food is truly Chinese. El Toro Cantina - Reclamation, Bandra, Mumbai. El Toro Cantina may sound Spanish due to its obvious naming and it does use the two words most Indians associate with Spanish. Cantina however is a term rarely heard of in India, I first heard of it in the 90s while watching Star Wars - a New Hope. A Cantina in Mexico or Spain usually serves drinks and small plates or Tapas. Literally, it could mean an equivalent of a canteen or a mess. However El Toro Cantina is a mix of a cantina, a sophisticated cafe and a fine dine. 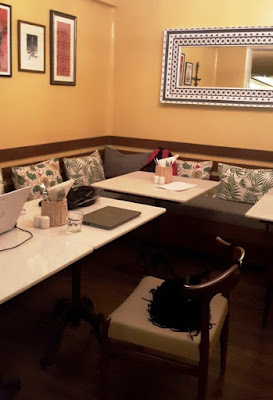 It had a pleasant ambiance which felt very European in decor. Thankfully, it hadn't used any annoying stereotyped cultural props like most foreign cuisine restaurants in India now days do. I arrived here on a rainy afternoon for a late lunch. The place felt quite comfortable. The bar was radiant and looked straight out of a popular pub. The food was very continental. It was a mix of Spanish, Italian, French and Portuguese. Do note that there is a difference between Spanish and Mexican food. Spanish food is made out of native and European influences while Mexican food is a mix of Spanish, South American and Texan influences. The Mediterranean flavors suit Indian palates very well and as such I can see El Toro becoming quite popular in the future. Here is what I sampled. These colorful citrusy cocktails were ideal for a summer afternoon which was still hot despite the rain. The colors of these cocktails blended well with the vibrant ambiance of the Bar. Beetroot Carpaccio was an Italian appetizer that worked well as a vegetarian version of the meat based Carpaccio. It added green to the red and white themes commonly associated with Carpaccio. The Beet was marinated in liquor and was the hero of the dish. Its addicting flavor made me gobble down this salad in no time. 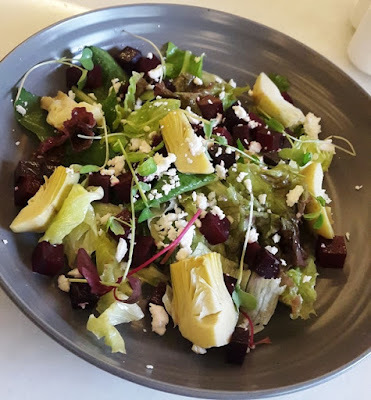 Crumbled Feta provided a salty depth to the sweet, tangy and candied beets. 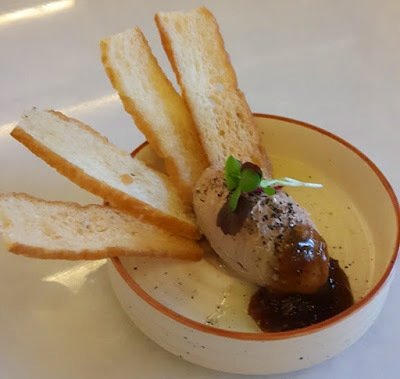 Chicken Liver Pate. I will admit that Liver is one part of any meat that I vehemently avoid. However the pate here was a balance of both bitter and savory. The Pear Jam drizzle and the Melba toast helped augment the flavor profile. I could eat a substantial portion of it but I'd still stick to avoiding liver in the future. Pollo, aceitunas y chorizo was a mix of spice rubbed chicken chunks tossed in Chorizo oil and mixed with Spanish Chorizo and Olives. This was quite a delicious snack. The flavor seduced my taste buds to no end. 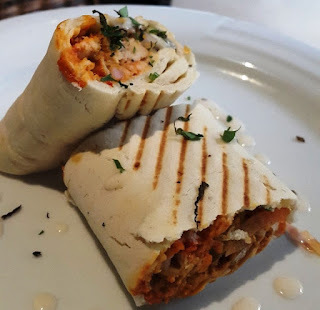 I love Chorizo and it was a nice change from the Goan chorizo that I am so used to. The flavor was subtle, less spicy and quite savory. 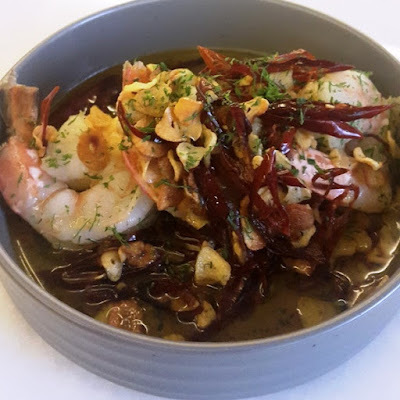 Gambas al Ajillo is a famous prawn dish from the region of Catalonia. 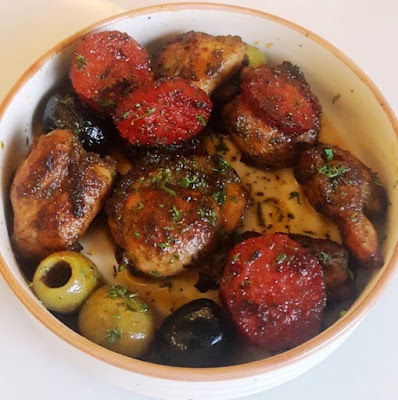 Made with a mixture of native Catalonian, Spanish mainstream and Italian influences - this dish was a bowlful of flavor. 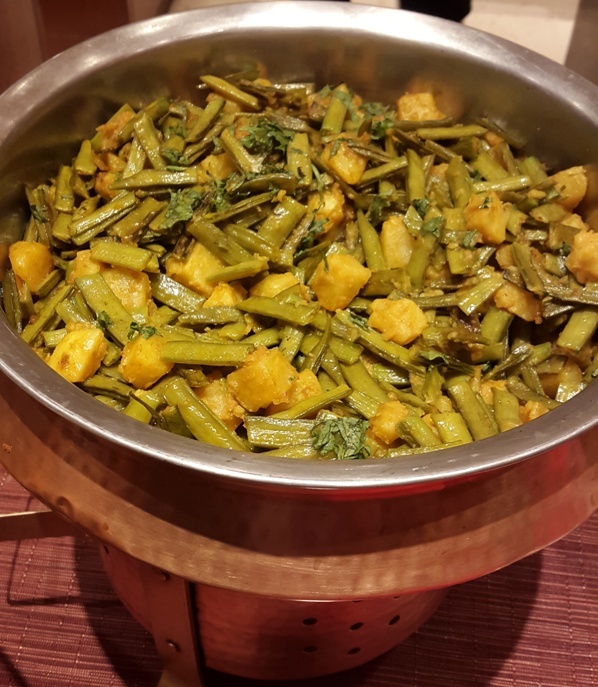 Its garlicky and subtly spicy flavor will pamper Indian palates quite a lot. The dish went well with the drinks, although it could use a bit of improvement on the presentation part. Braised Lamb. 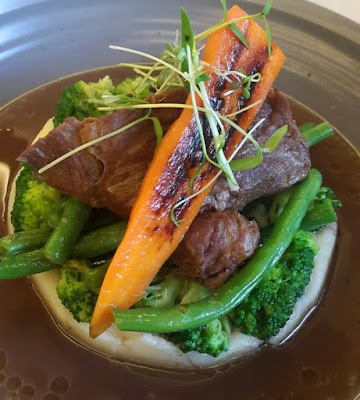 This delicious slow cooked lamb looked like a mountain of meat surrounded by a forest of vegetables sitting on top of a potato mash island surrounded by a sea of black pepper gravy. Maybe that's my travel seeking self drifting away while writing this though ha. 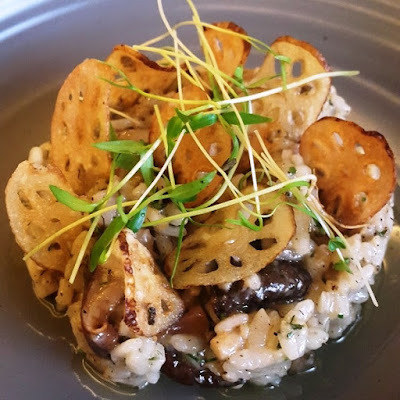 Risotto of the day. As the name suggests, this one changes everyday. The Arborio was topped with a ton of fried lotus stalks. The dish was delicious though I have had better. 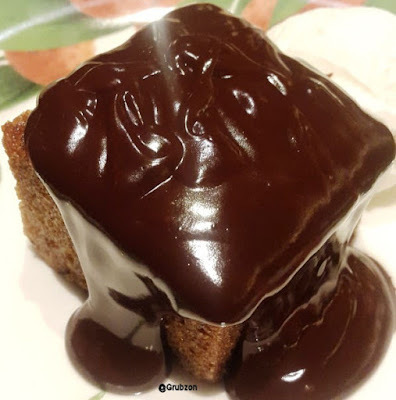 Sticky Toffee Pudding. Pretty sure this was the puddin' Harley Quinn keeps jabbering about. 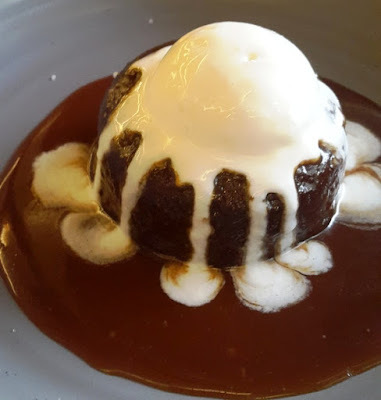 This has to be one of the best Sticky Toffee Puddings that I have had anywhere and I'd say this was the best that I have had in Mumbai. The Toffee sauce was deliciously rich and the cake was soft and fresh. The Ice cream was of premium quality. All elements worked well over here. A sweet alchemy well orchestrated. The service was good and the staff knew the menu well. Despite the place being new, the servers made it feel that they have been running the show for years. 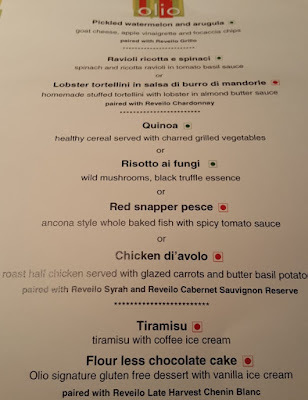 The pricing is slightly on the higher side but if you have made it this far into reading this article, I am sure that you can tell that the grub was well worth the moolah. To wrap this up, El Toro Cantina delivers well with its Pan European food, ambiance, drinks and service. But can it sustain itself in an area infamous for open and shut eateries? Time will tell but from my side I'd say it was a rainy afternoon well spent. There is this Manga or Japanese comic strip that I read called One Piece. In it a character named Sanji is shown as a runaway Prince serving as a cook on board a ship Captained by the protagonist. The author of course has employed an adventurous fantasy. But fantasy sometimes does become real. Chef Akshraj Jodha, a descendant of Rao Akheraj of the Akheraj dynasty in Rajasthan would technically be a Prince. A Prince of Chefs who brought amazing food from the House of Akheraj. The Rajasthani food festival was one of many food festivals held at the ITC Grand Central. I will be honest, Mumbai's take on Rajasthani food had left me disillusioned. I did not attend this festival with big expectations. I mean, I was quite tired by the likes of those Rajasthani Thali restaurants serving inauthentic food. However, not only did the food at Hornby's Pavilion take me by surprise, it made me completely change my perception of Rajasthani food. Chef Akshraj personally cooked everything for the duration of the festival. He ensured that the food remained authentic and completely followed his recipes. I enjoyed both the Vegetarian and the meat based grub in this festival. The man really is a Prince of cooking. Here are some of the dishes that I tried. 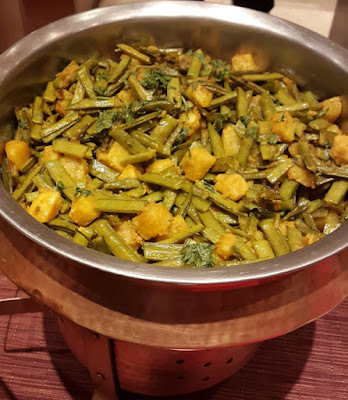 Aloo Gawarphalli was a vegetarian dish made out of cluster beans and potatoes. I dislike cluster beans usually. I have since childhood swept them to the side of my plate, unconsumed. However, I found myself taking a second helping of the cluster beans over here. The flavor was completely different from the one I am acquainted to. It was a mix of bitter, sweet and salty flavors. I must call the chef a genius over here. No one has so far been able to make me eat Cluster beans before. 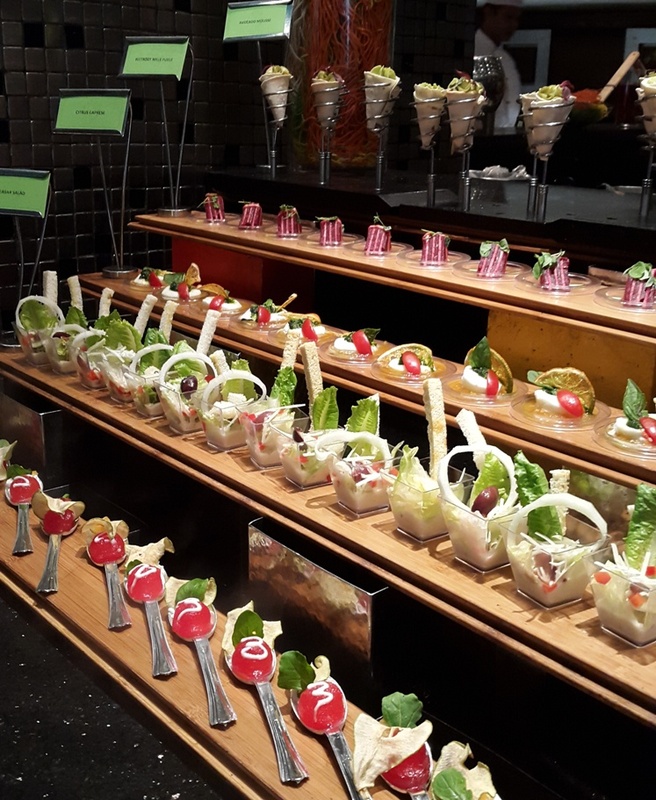 The salads and chaat counter had a mix of interesting appetizers. 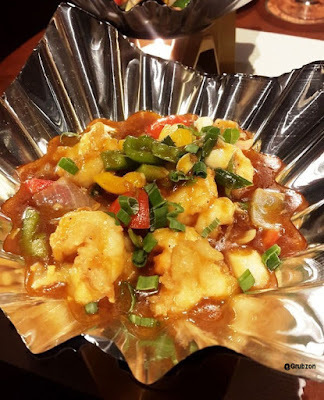 These "Chaats" had unusual ingredients like Jalebi in it. If you love good Indian food then these are for you. 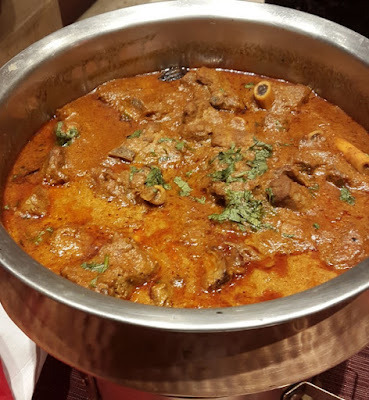 Laal Maas or Read Meat was historically a curry made out of wild game meat like deer or Wild boar. It was a favorite among the royals. But now days its made of tender lamb. Hornby's version was a beautiful flavor pot of spicy and savory sensations. I do not think that I have had a tastier Laal Maas than this. 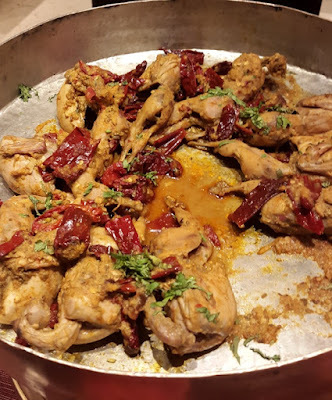 The Rajasthani Quail was a decent experience though I have had better variants elsewhere. Apart from the above, there was a live counter with fish tikkis and vegetarian tikkis being cooked for the patrons. 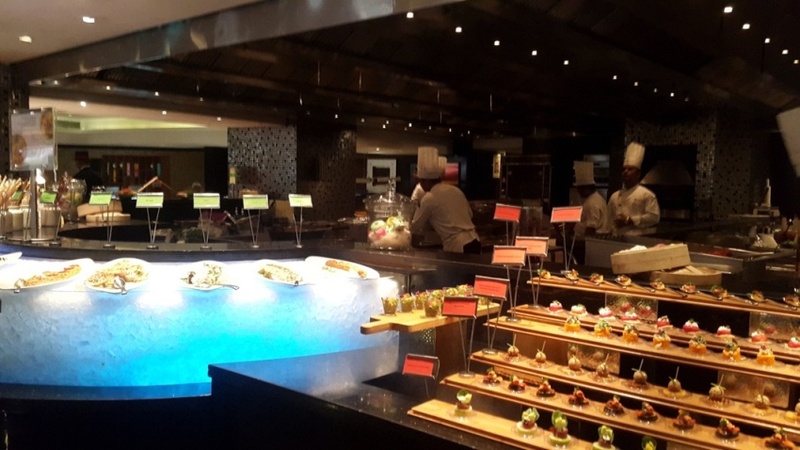 Being a Five star hotel property, the restaurant also had its regular buffet options along with the festival buffet options. In completeness, it was a great experience. My best at ITC so far. 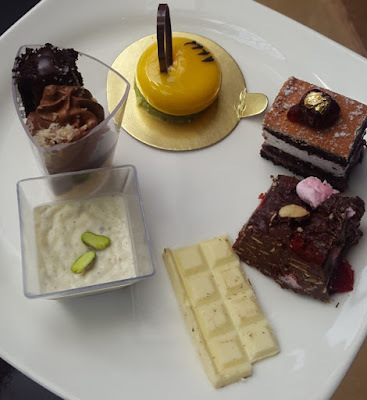 The Dessert platter was one of the better ones in Mumbai. I found myself saving just enough space to hog a plate full of desserts. 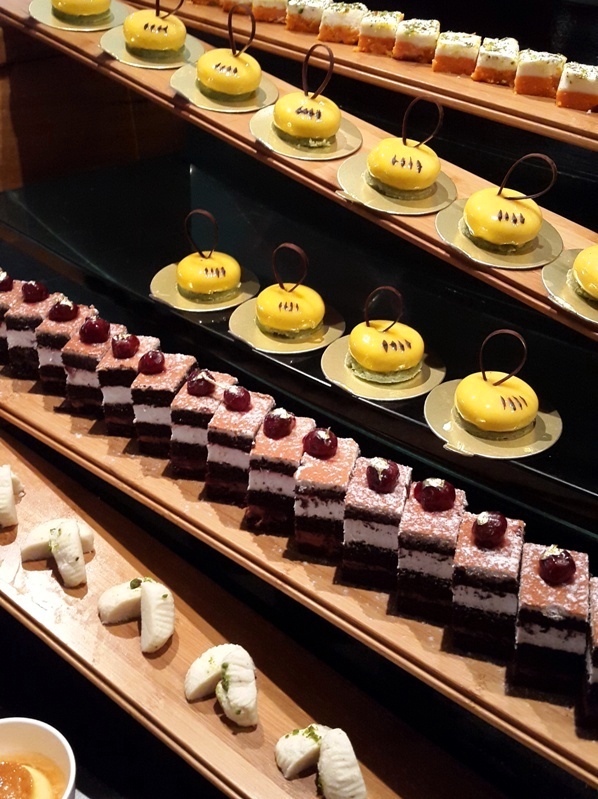 The service at Hornby's Pavilion was as excellent as that at Shanghai Club and K & K. It goes hand in hand with ITC's exemplary hospitality. 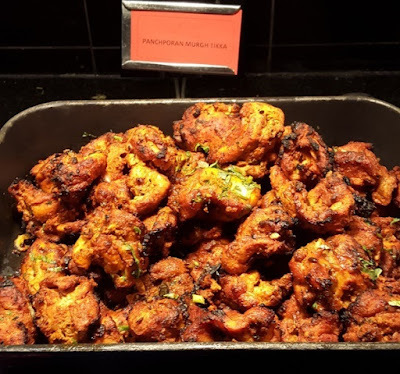 The Pricing was on the higher side as it is a restaurant inside a five star hotel, however this was the best Rajasthani food that I have ever had. I think the food at the ITC makes the festivals well worth the cost and time. Its shame that festivals are ephemeral. 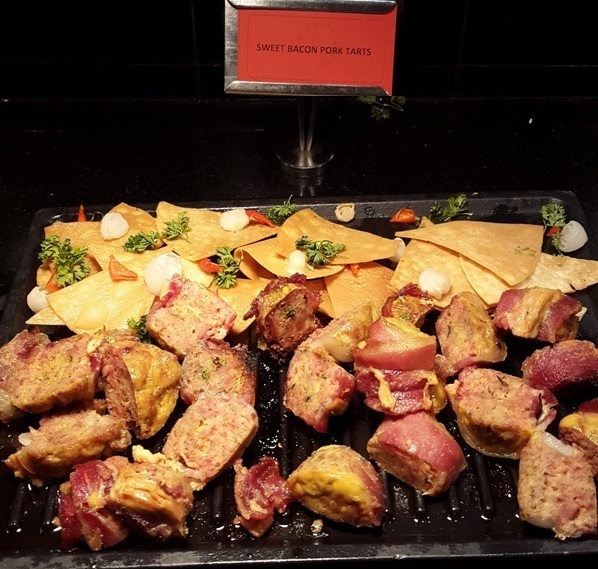 Nonetheless, Hornby's pavilion offers a GREAT dinner buffet platter. Well worth a visit at any time of the year. Olio could mean a lot of things. It could mean Oil in Italian, Cooking pot in Latin or even a Spanish stew. But one thing is certain, it serves good food and that is in agreement with all of the above. Located at Novotel Juhu, Olio is the classy western fine dine for those interested in an authentic western meal in a refined environment. Like Square next door which is Novotel's general purpose Buffet restaurant or the famed Chinese restaurant Sampan, Olio offers the guest a unique culinary experience. I was part of a large chef's table that saw bloggers from around the town sample the food and express their opinion. The occasion was a revamped and upgraded menu. 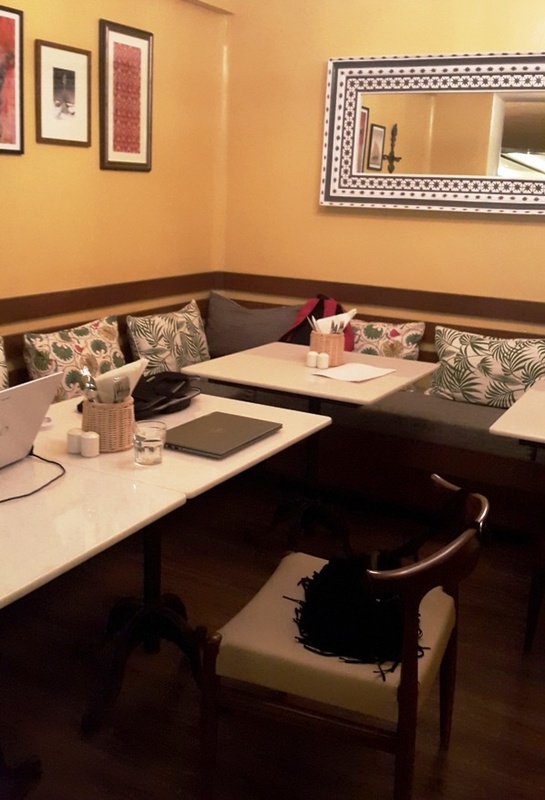 Moderately sized with classy western decor that felt like a mix of Spanish and Italian, Olio had quite a comfortable ambiance. 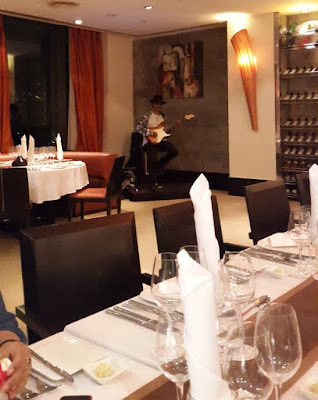 As opposed to overused Kenny Gs that I have grown up hearing in fine dines, this restaurant had live music and a guitarist who had an uncanny resemblance to Carlos Santana. I enjoyed his eighty's numbers. Anyone who loves the eighties has good musical taste. A Four course Italian meal awaited me after I was done savoring the environment. The dinner flagged off with this delectable Amuse Bouche which was made up of cheese and Italian seasoning. 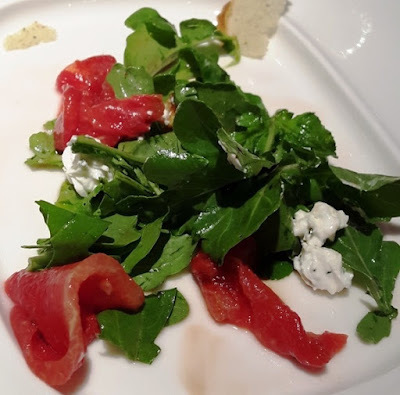 The pickled watermelon and Arugula salad was quite flavorful. It paired excellently with Reviolo Grillo served along with it. It seemed to increase my appetite even more for the succeeding courses. 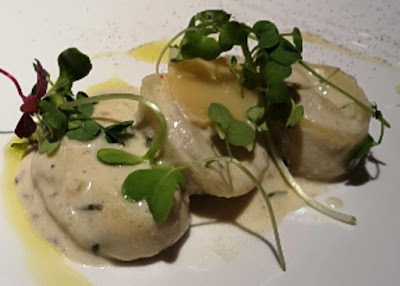 Lobster Tortellini in Salsa di burro di mandorie sounds like a quite a mouthful to speak but leaves you wanting for more when you eat. Soft melt in your mouth pasta with lobster and almond butter sauce was quite the smooth experience in the mouth. 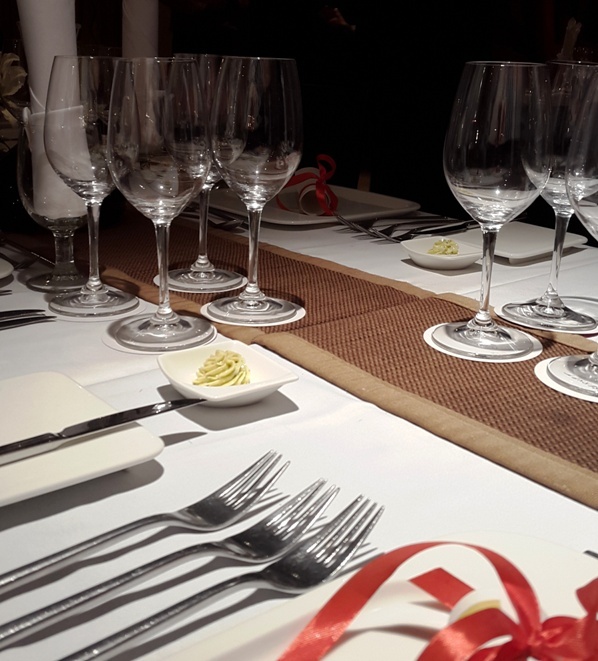 Paired with Reviolo Chardonnay, this course truly epitomized the spirit of a fine dine. 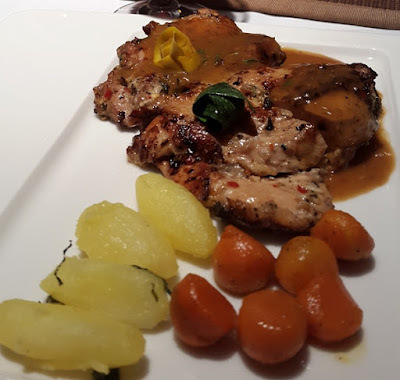 Chicken Di' Avolo was a main course with good old chicken breast, carrots and mashed potatoes. I felt it was juicy and delicious at the start but a little bland at the end. The flavor did not feel uniform. Though paired with the Cabarnet Sauvignon which had a strong flavor, it felt quite perfect. The wine pairing was done by someone who knew their wine and food well. 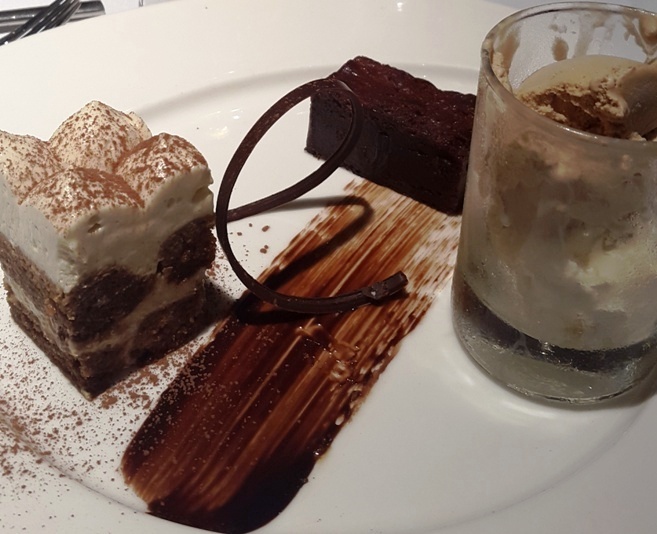 The dessert platter which comprised of Tiramisu and Flour less Chocolate cake felt a little flat. The Tiramisu felt too creamy and the cream felt too thin. The perfect coffee bitter could not be perceived. And I have definitely had better Flour less chocolate cake before. Barring the Dessert course, the other courses were quite exemplary. It was worth the long travel during rush hours. The service was professional as expected. The crew ensured that every member of the table was satisfied. The pricing could be on the higher side. While the food is good and the location is prime, the pricing could be a slight turnoff to patrons who are not hotel guests. 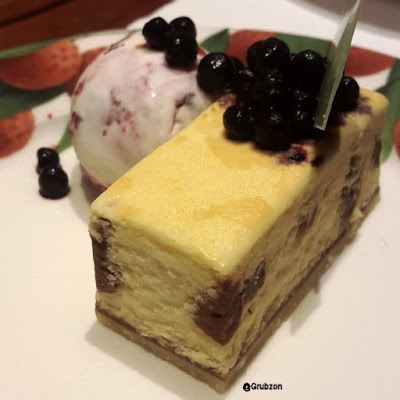 Combined with the pleasant location near the sea where the coastal breeze caresses your senses, the comforting indoor ambiance, classy music and high quality food - The pricing can be overlooked by a true connoisseur. At least one trip seems to be in order for food lovers all around. Mango, India's favorite food has the effect of driving the majority of the Indian population wild. As soon as the mango season begins, people crowd up at fruit stores buying them like hotcakes. Actually in India, one must say that hotcakes sell like mangoes. I proudly declare that I am not in that majority. Nope, the fruit's presence or absence doesn't affect me. 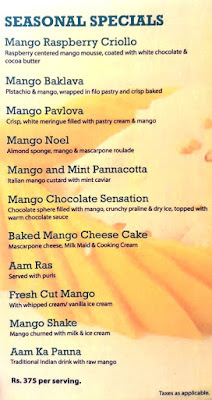 But Mango desserts are another story, they give me a high. I dropped by last week to sample a special menu of Mango based desserts at the Sin patisserie within Hotel Marine Plaza. This seasonal special menu would last till the mid of June. 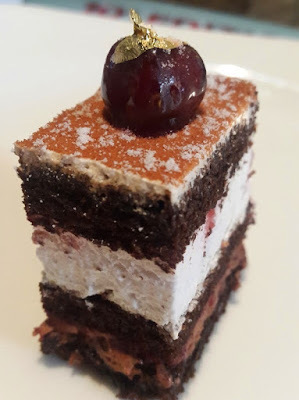 At INR 375(plus Taxes) per dessert , the place actually offers cheaper desserts than the likes of a place like Indigo Deli. The desserts are made of premium ingredients and have a great flavor. There is no compromise on quality. This platter would make most of humanity salivate in front of their screens. 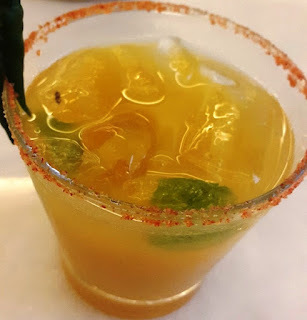 Aam Ka Panna would be India's favorite summer drink. Sweet and sour in flavor, this spice filled beverage isn't really a dessert but one could never have a Mango themed menu in India without the mention of this. 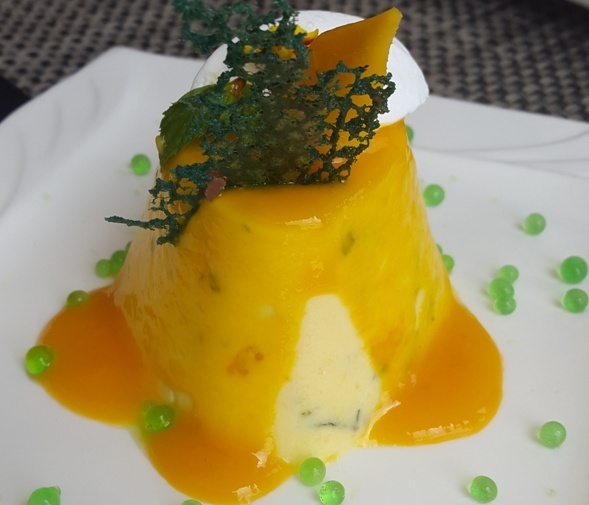 Mango and Mint Panna Cotta was a delectable panna cotta topped with a thick Mango paste and Mint pearls. Though initially I was a bit disappointed that it was Mint and not peppermint, the rich flavor of the cream made up for everything. I gobbled this up in a jiffy. Mango Baklava is probably something that the Ottomans and the Greeks would never have imagined. The chefs at Sin took this old world favorite and gave it a Mango Twist. 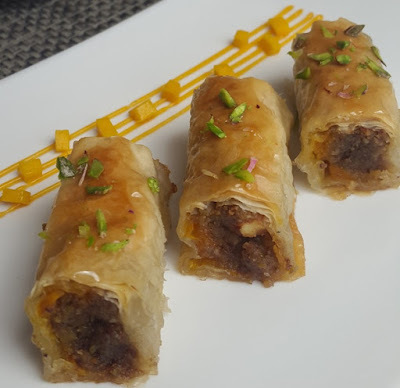 The result was classical Baklava with a perfect mango infusion. Baklava itself is rare to find in the city and Mango Baklava may just only be available at Sin. Though not aesthetically pleasing as its colorful counterparts, this was one of the high points of the seasonal menu. Mango Cheesecake in my opinion was the best dessert in the menu. It delivered in both visuals and flavor. Not only was it the prettiest of the lot, its flavor was quite amazing. 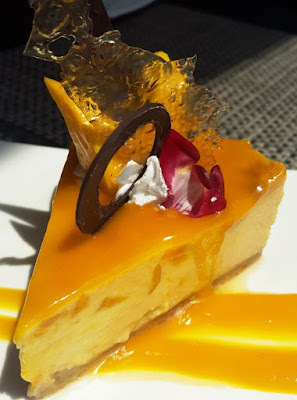 Unlike Cheesecakes at other places where vanilla cheesecake is merely topped with a compote, this truly was a mango cheesecake. The cream cheese and Mango had been perfectly fused together. The texture was smooth and perfect. Mango's sweet and tarty flavor combined with Cheesecake's original sweet flavor was quite a party in my mouth. Mango Chocolate Sensation was Sin's take on the popular melting chocolate ball. 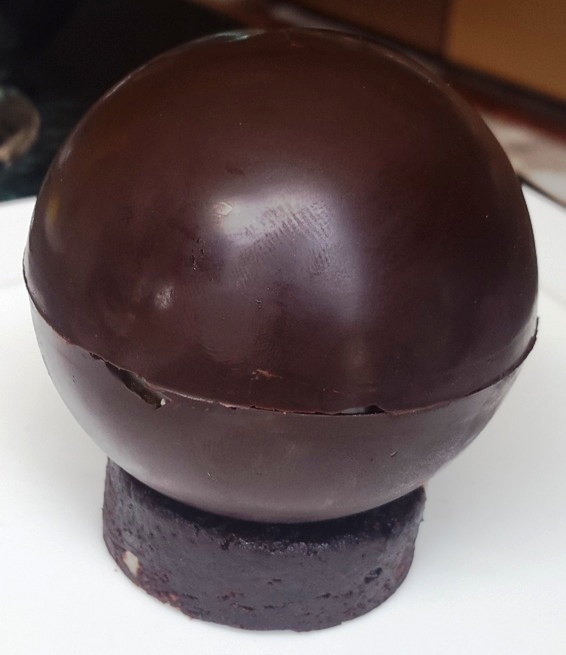 Though these balls have long lost novelty due to being too common, these still make an excellent dessert for a bunch of food shutterbugs. I was disappointed with this one though. The flavor of the mango was far too subtle and as far as Chocolate ball desserts go, this was too mediocre. Mango Raspberry Criollo was a delicious comfort dessert. Made with a Mango mousse centred with a Raspberry compote, the hero of the dish was undoubtedly the raspberry. 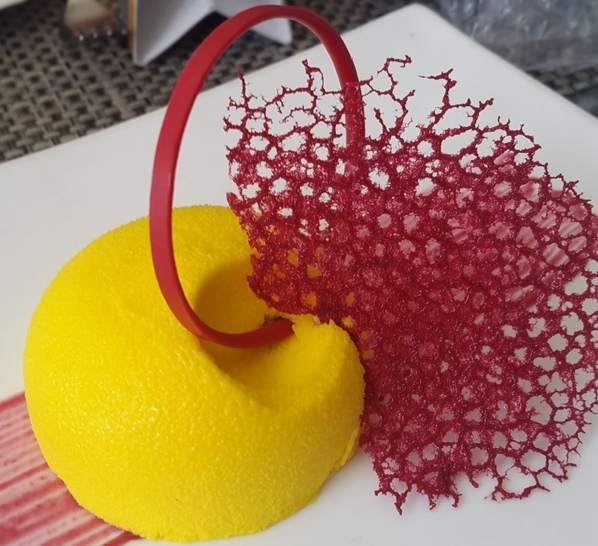 While the mango served as a nice and alluring exterior, the flavor profile was dominated by the Raspberry. The dessert was however one of the best on the menu. Again like the cheesecake, it was both visibly pleasing and quite delectable. This seasonal menu is said to last till the Mid (15th) of June, 2017. That is about the time when the Mango season goes offline from India and the Monsoon sets in. 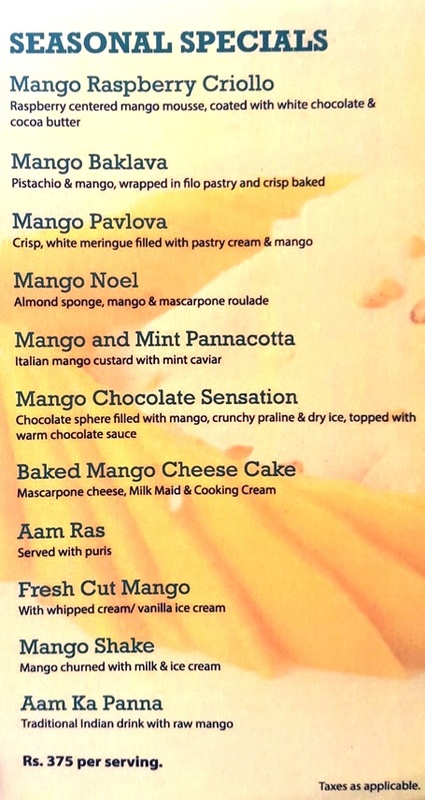 If you are a dessert fanatic like me, don't miss this opportunity to sample things like the Mango Cheesecake or the Baklava. 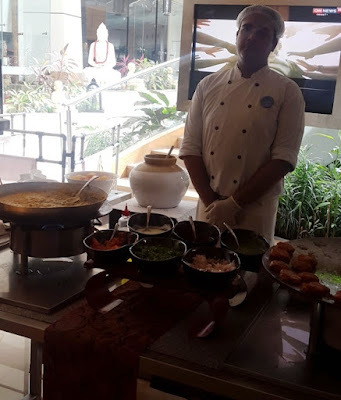 The Sunday Brunch at The Earth Plate in Hotel Sahar Star - Vile Parle, Mumbai. The Earth Plate is a massive multi cuisine restaurant within the Sahara Star property. A meal here will always be an experience to remember. 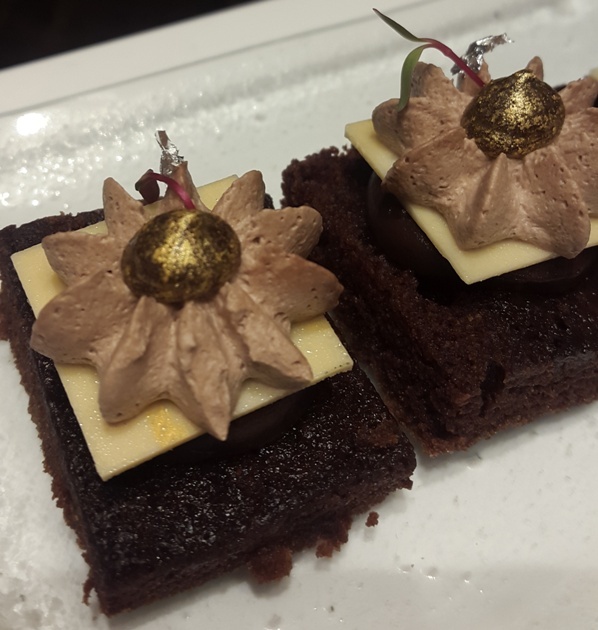 But when Sahara Star goes out of the way to take the meal experience to the next level - sparks fly, flavors explode and one experiences a culinary journey like none other. The Sunday Brunch Buffet at "The Earth Plate" is a very special affair. Unlimited food, beverages, desserts, Live music and live food counters await the patron. As opposed to the other days of the week, this brunch is far more massive and has live counters which cannot be found on other days. And if this isn't impressive enough then how about a dip in the pool after your meal? As part of the package, Sahara Star allows the patrons to have a dip in the pool post Brunch. Sahara Star's unique closed dome structure makes it a completely different biosphere isolated from the pollution, noise and chaos of the outside world. And within this Biosphere, each of its restaurants inspire unique feelings. For me, The Earth Plate felt like a resort restaurant in the midst of a popular tourist destination. The restaurant was classy, yet embraced simplicity in design. I completely forgot that I was still in Mumbai. There were seven live food counters each managed by a resident chef. Pictured here is the Bombay Street food live counter. 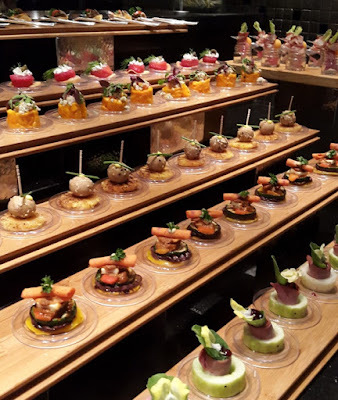 These appetizers caught my eye, it was almost as if I was in a designer Jewellery store. These edible beauties were extremely pleasing to the eye. Both these pictures sent my Instagram following into a frenzy. I received numerous messages about these two pictures. Take it from me, the food tasted as wonderful as it appeared. After quickly framing the food on my phone, I went on my tasting spree. Each of the appetizer was extremely well made. I have to admit that the Kitchen team takes their job very seriously. These were some of the best starters that I have had anywhere in the world. Each morsel was an unique experience. 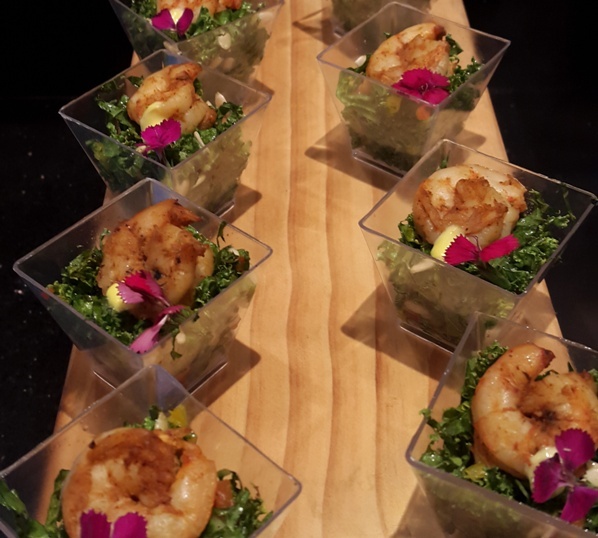 I am not a salad person but these Prawn salad cups made me go absolutely bonkers. These were quite scrumptious. I found myself picking up seconds after my initial tasting. Something one would rarely see me do with salads. The mains rotate every brunch so its unlikely that one would find the same as those pictured in this article. There were far too many mains to taste. I managed to sample a few and below are some highlights of my experience. The Beans Pie was extremely pleasing on the palate. T'was subtle in flavoring and made for a Global crowd. The Sweet bacon pork tarts were quite addictive and I found myself chomping down a few of these. The Panchporan Murg Tikka was Chicken Tikka with a twist. It was sprinkled with the Panchporan spice mix which is an East Indian specialty. 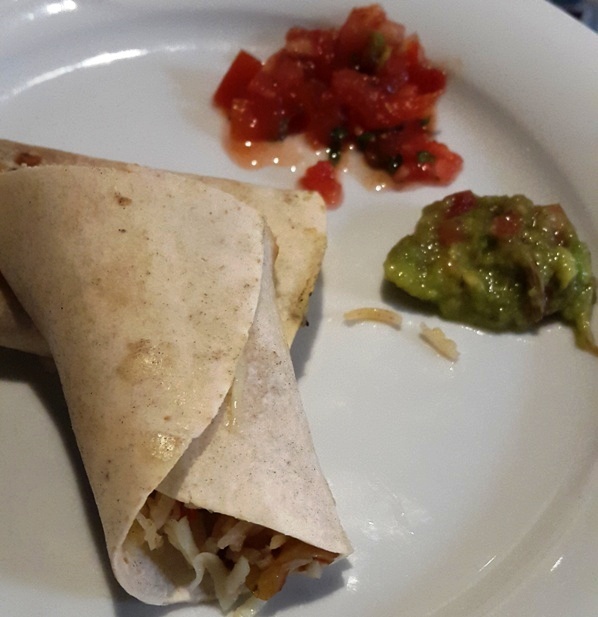 The Chicken Burrito and Shawarma were delicious wraps made at the live counters. One need not wait at the counter for their serving. Give the line cook your table number and a server will bring your food to the table. It was quite convenient and something not often seen in most five star hotels. The restaurant experience would surely spoil me ha. The dessert platter felt like a wonderland where one could unleash their inner kid. 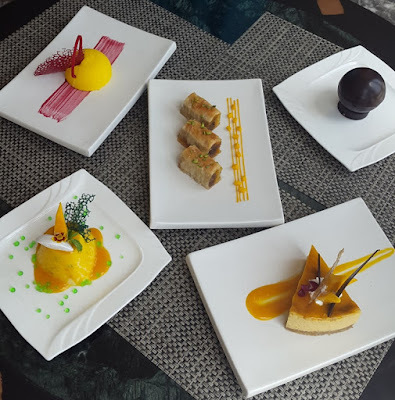 You think you have grown up into a serious, mature and a professional man till you see these desserts and the world feels young again. 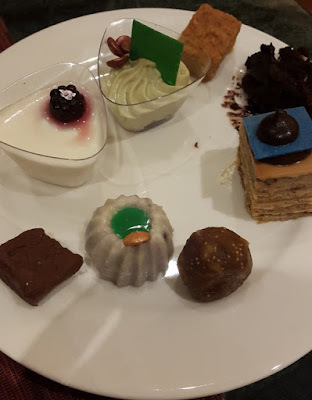 There is always room for dessert but there were too many desserts in the room. I sampled quite a few and I found the Black Forest cake to be my favorite. The service was exemplary despite the Sunday rush. 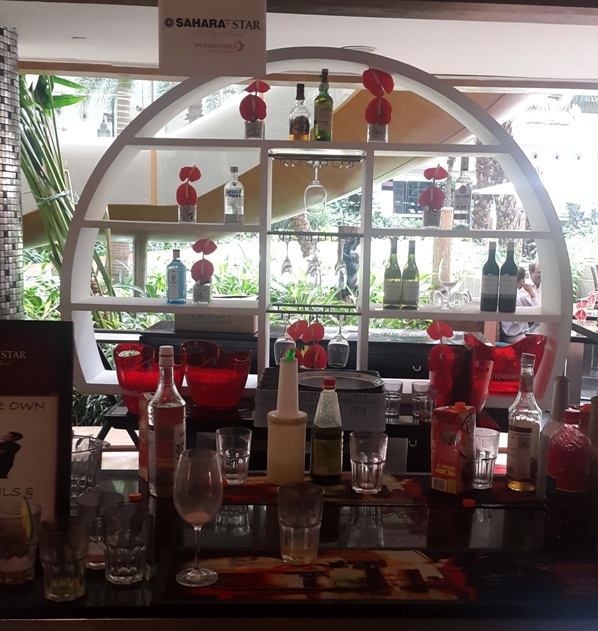 It displayed the professional calibre expected off the staff of Sahara Star. Priced at INR 3450 PAX, the brunch feels a bit steep initially but consider the fact that it includes unlimited premium liquor, wines and cocktails on top of unlimited food and desserts. This is a meal fit for a King and if you drink and eat to your heart's content then its worth every rupee spent. Lets not forget, this includes a dip in the pool which is far better than your average community pool. The Brunch is here to stay for the time being. 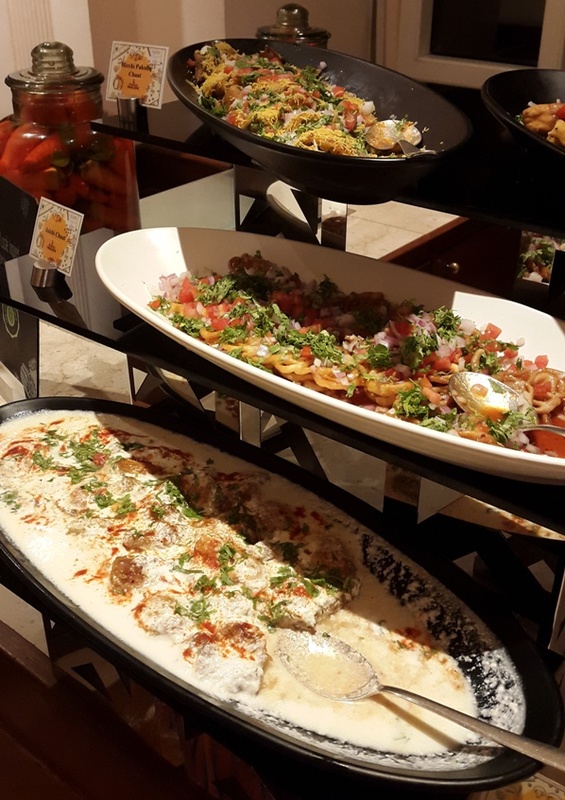 If you are near the Airport or planning a memorable Sunday Brunch, Sahara Star makes one of the best choices in the city. 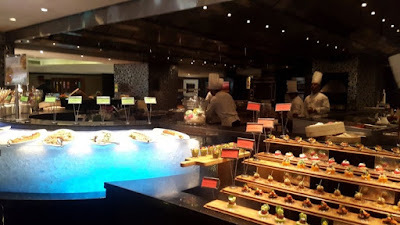 As far the buffet experience goes, its one of the best that I have had. Captain Says Onward, Ho.